Pure luxury. Our 100% natural herbal soaps are handmade in small seasonal batches for the purest bathing experience around. Made with herbs, flowers & grains to create unique textures & colors. Rinsing hair, face, even clothes, with rainwater, has been a beauty tradition for generations. Rainwater leaves a fresh, clean softness to everything. Our soaps are handmade with melted snow, (frozen rain!) that is collected from winter to early spring, then carefully filtered & mixed with 100% botanical ingredients, creating the finest soap & pure bathing experience available. Every variety is prepared with a combination of pure saponified* oils: olive oil for a soft, moisturizing quality, palm oil for a rich, smooth lather & coconut oil for its cleansing strength. The oils are then combined with real herbal ingredients. The seasonal herbs create unique textures & colors. The gentle fragrances come from 100% essential oils. No artificial dyes or fragrances are ever added. 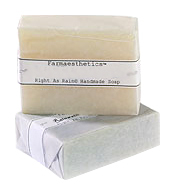 Our soaps are made by hand in small seasonal batches, with no animal constituents or testing.